Holy Week in Peru: Ayacucho, food, heritage, culture and more! This article was posted on Thursday, March 29th, 2018 at 1:13 pm and is filed under Festivals, Holidays. In the capital, Huamanga, the celebrations begin with the so-called “Doloroso Friday”, previous to Palm Sunday, gathering thousands of parishioners around the Lord of the Agony and of the Sorrowful Virgin, in a meeting that personifies the suffering of Christ and his mother’s. Minutes after noon on Palm Sunday the traditional entrance of the “Chamiza” or retama -species of dry plant- to the Main Square, which consists of the passage of a tropelía of beasts and donkeys -ended with branches of this plant- pulled by the settlers who, breaking through the crowd, explode rockets and bombards. 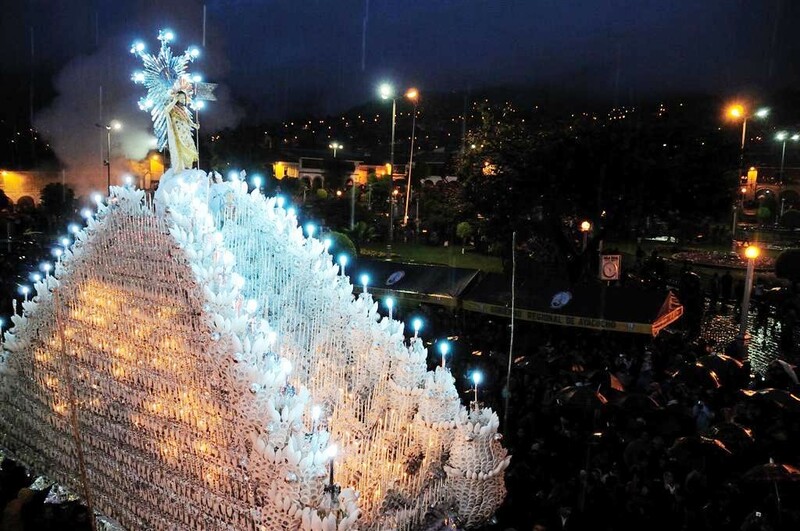 Upon reaching the main square of the city, the “chamiza” is deposited in a discreet location on the side of the Cathedral, where it will remain intact until dawn on Easter Sunday before being incinerated. Both march together to the temple of Santa Clara, where they left at the beginning of the day, accompanied by María Magadalena and San Juan, in litters. A sea of people accompanies the litter of the Resurrected Christ in the main square of Ayacucho. On the Saturday of Gloria, the pagan ritual is present in the Acuchimay hill, where a popular fair is organized in which all kinds of handicrafts are sold, typical drinks such as chicha, fresh cheeses, “detonating peppers” and soups. Holy Week comes to an end on Easter Sunday or Resurrection, just as the dawn colors the city with a radiant blue. On the same day the population goes from grief and sorrow for the death of Christ to the joyful singing of hymns of glory for the risen Christ. Thousands of faithful accompany the litter of Christ before the beautiful architecture of the Huamanga Cathedral. Beautiful designs made with flowers and lands of colors by Ayacucho artisans who wait anxiously for the passage of the Lord. The Lord makes his appearance in a monumental pyramid-shaped walk, while the smoke of the burning “chamiza” has as a background the bending of the bells, the chants and the fireworks, which signal the epilogue of this unforgettable week in Ayacucho. that will be repeated with equal or more fervor next year. Visit 3 New Wonders in 10 Days / Extend the offer until September 30th! We loved best peru Tours, they promptly picked us up at all points of transfer, the guides were fun and informative. We hiked the 4 day Inca trail (Papa Freddy and Jimmy were awesome trail guides) and also enjoyed HumanTay Lake, Sacred Valley and city Tours. Highly recommend!